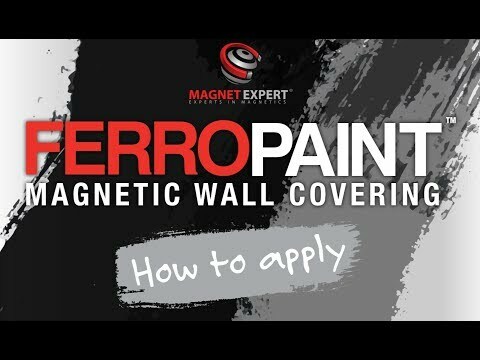 Apply FerroPaint® to walls, doors and furniture to create an engaging ferrous surface that magnets will attract to. Transform your home, office or school with FerroPaint® and remove the need for tacks, pins and nails. For more information on how to apply FerroPaint®, where best to use it and how to make the most of your ferrous wall, visit our FerroPaint® brochure. Alternatively, browse our extensive range of magnetic wall coverings with our wall coverings brochure. Creates a surface magnets will attract to. FerroPaint® is a water-based emulsion that contains fine iron particles. Once the final coat is dry, paint over the FerroPaint® with your desired emulsion. The surface will remain magnetic. FerroPaint® is best applied with a short nap roller. Use FerroPaint® with Neodymium magnets and magnetic sheets or tapes for the best magnetic attraction. FerroPaint® is a water-based emulsion with fine iron particles, that when applied to walls, doors and furniture, creates a ferrous surface you can attract magnets to. Use FerroPaint® in various walks of life, from your children’s bedroom where you can create an interactive space, to the office surroundings where you can display marketing and presentation materials. FerroPaint® is popular in schools too as it removes the need for tacks, pins and nails when creating displays. FerroPaint® is non-toxic and non-formaldehyde, with low VOC. It may stain clothes; if you do get it on your clothing, rinse immediately and wash thoroughly. FerroPaint® will not interfere with electronical equipment like televisions and WIFI signals and is safe for use in homes, offices and schools. To apply FerroPaint®, start off by removing any uneven or peeling areas from the surface, sanding it down to give the smoothest possible finish. Before you apply FerroPaint®, we recommend you prime the surface, particularly if you are working on glass, wood, metal or plastic. The best surface to apply FerroPaint® to is on top of a water-based primer. Alternatively, latex paint will also work. Once you are ready to paint, mix your tin of FerroPaint® for 3-5 minutes to ensure the iron particles are mixed in sufficiently. Using a short nap roller, apply 3 coats of FerroPaint® to your chosen surface, leaving 4 hours between each coat. When you have applied your third and final coat, leave the paint to dry for 24 hours, before applying your desired top coat of emulsion. Once the area has completely dried, use your newly ferrous surface with Neodymium magnets or flexible magnetic tape for the best magnetic performance. Visit our online FerroPaint® brochure where we have everything in one place, including how to apply FerroPaint®, where best to use it and how to utilise your ferrous surface. Download a copy too and keep it to hand. At MAGNET EXPERT®, we have a wide range of magnetic wall coverings designed for various applications across the home, school and workplace. Visit our magnetic wall coverings brochure to view all options and the potential benefits to your project.